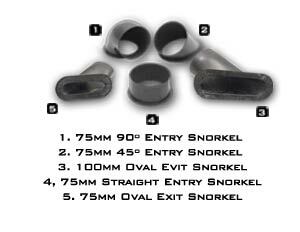 Reverie produces various intake snorkels to compliment our range of air boxes, our conventional circular snorkels can be used with all of air boxes and our oval exit ‘crushed’ snorkels are best used with trimmed versions of the Hockenheim and Interlagos air boxes. We produce angled and curved snorkels for use when fitting air boxes in confined engine bays where routing ducting is difficult. Examples of air boxes with snorkels can be seen in the gallery. If you have any questions regarding our snorkels or any of our products please feel free to contact us.